Many of us plan our finances so that we can build wealth over time. However, the problem with starting out from a place of fewer resources is that it’s easy to think of wealth as the end product. Many of those with financial resources find themselves the targets of lawsuits. If you have a lot of money, you are more likely to be a target. If you are in an accident, or if someone slips on the ice in front of you house, and you are clearly wealthy, you are more likely to be sued. Umbrella insurance can help protect your assets. Many insurance policies have limits on payouts. If you need more coverage in order to prevent the loss of assets, you can purchase umbrella insurance. Professionals and many business owners get this type of insurance to protect their assets. If you don’t have this type of insurance, and you are sued, your assets could be at risk. With the right coverage, the insurance company pays what is owed, and you avoid having your resources drained. Malpractice and errors & omissions insurance policies are examples of professional liability insurance. The more money you have, the more you pay in taxes. While you should pay your legal share in taxes, there’s no reason to pay more than you have to in taxes. The right tax planning can help you keep more of your money. Tax-advantaged investment accounts, as well as estate planning strategies can help you put more of your money to work for you. Consider your financial situation, and recognize your liabilities. In many cases, the wealthy have used other people’s money to get to where they are. The judicious use of leverage can be a help. But you also have to get rid of liabilities when you can. Pay off your obligations, especially if they are costing you a lot in terms of interest. Once you have more assets, look at how you can reorganize your finances so that you are putting more into assets, and getting rid of liabilities. Keeping those liabilities can put your resources at risk by threatening to drag you down. One of the ways you can keep building your wealth is by investing it. Putting your money to work on your behalf can be a great way to protect your wealth. However, you do need to watch out for scams. Many of the newly-rich are targets for investment fraud because they have resources, and are interested in perhaps growing their wealth a little more. In order to avoid losing your hard-won fortune, you need to make sure that carefully vet all opportunities that come your way. You don’t want to fall victim to scams. Remember that Bernie Madoff targeted mostly rich people. Many of the people who lost money were people who lost millions. Watch out for “investments” that seem to return a great deal like clockwork, or that promise you an amazing chance to get in on a “ground floor.” Before you put your money into something, you need to make sure that it really is a good investment. While you deserve credit for building your wealth and managing your financial resources, you also don’t want to get too cocky about your success. In many cases, success leads to feelings of invincibility. Many people who make money with investments are so sure of their genius that they take progressively bigger risks in order to make even more money. They think that they will always pick winners — no matter how exotic or risky the investment is. This overconfidence can lead to taking ill-advised risks, and lead to huge losses that can mean the loss of your fortune. 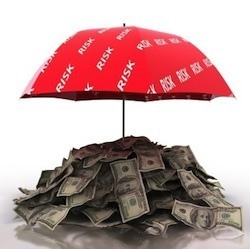 What other ways can you protect your wealth once you earn it?